Just read on to get some tips and tricks for casting local media Blu-ray/DVD/HD Videos thru Chromecast to HDTV fast and easily. You may downloaded some movies, collected some DVD disc and Blu-ray disc, or buy some hot movies form Apple iTunes store etc. How to play these movies on Ultra HD TV via Chromecast? Chromecast is a streaming device that can be plugged into HDMI port right through your TV to cast music, photo and video to HDTV from your PC, tablet, smartphone and other portable devices. In order to stream Blu-ray, DVD movies and all kinds of videos to TV with Chromecast, we should have a brief knowledge of Chromecast supported video formats at first. 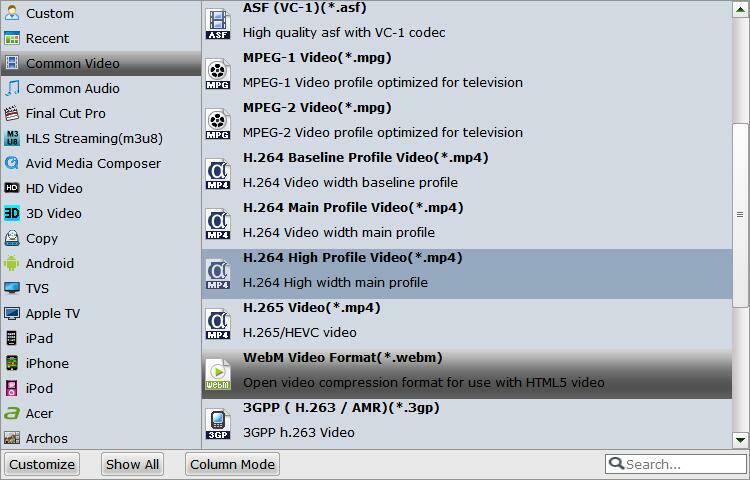 • MP4 – .mp4 file encoded with H.264 High Profile Level 4.1 video codec and MP3/AAC audio codec. • WebM – .webm video encoded with VP8 video codec and Vorbis audio codec. So, we need to convert Blu-ray/DVD discs or HD Videos (MKV, MOV, WMV, AVI, FLV, F4V, etc.,) to a Chromecast friendly format (e.g. MP4) in advance. Brorsoft iMedia Converter for Mac is a professional Videos to Chromecast converter can help you successfully transcode any videos to MP4 in amazing fast speed without any quality loss. So, you can send Blu-ray/DVD/HD Videos to Chromecast for HDTV playback easily. Besides the ability to convert videos for smoothly playback with Chromecast, this powerful Video converter can also convert Blu-ray/DVD/HD Videos to Apple TV, iPhone, iPad, Android devices, PS4, Xbox One, Plex, etc. With its built-in video editor, you can also customize and edit your Blu-ray/DVD/HD videos before converting it to MP4 format. If you are running on Windows, please turn to its equivalent Windows version Blu-ray Video Converter Ultimate. Step 1: Click the button “File”, and from the sublist, click “Load from disc” to load your Blu-ray/DVD movies; click “Add video” to import HD videos. Step 2: In the dropdown list of Format menu, you can find the format you like. Just below Format is Output, here you can browse your computer for a better destination folder for Brorsoft Video Converter Ultimate to output your converted Blu-ray/ DVD/HD Video movies. The final step is to tap the Convert button and commence converting Blu-ray / DVD / HD Video movies to MP4 or WebM for Chromecast. Plug in Chromecast in the HDMI input on your TV, and then plug the USB cord on the other end of the Chromecast to power it. Make sure that your computer and TV are connected in the same network. You should be connected to 2.4 GHz Wi-Fi 802.11 b/g/n Wi-Fi network. If your Chromecast can’t be connected to the Wi-Fi network, please check the Chromecast router compatibility here. After installation, there will be a Cast tab on the Chrome browser. You can click the option button to set video quality as Extreme or High for your HD TV. Drag your converted movies to chrome browser, or press Ctr + O to browse and import your converted movies. And then your converted movies will be played in Chrome’s built-in video viewer. Then click the Cast current tab on your browser to stream media files to Chromecast and then play it on TV. thank you , with your guide, i have been finish my job ! I finally can watch my favorite movies on TV now. Thanks a lot! Perfect……………just what I wanted. Works easily and anyone can operate (successfully) this program. My issue is perfectly solved. Thanks a lot!